Kindle e-books would include in the text working hyperlinks, which would take you straight to the website, wiki, blog, Youtube video or MP3 tune after clicking on it in the text of the book itself. Gosh that would be much more easier to read and absorb even more from the book. 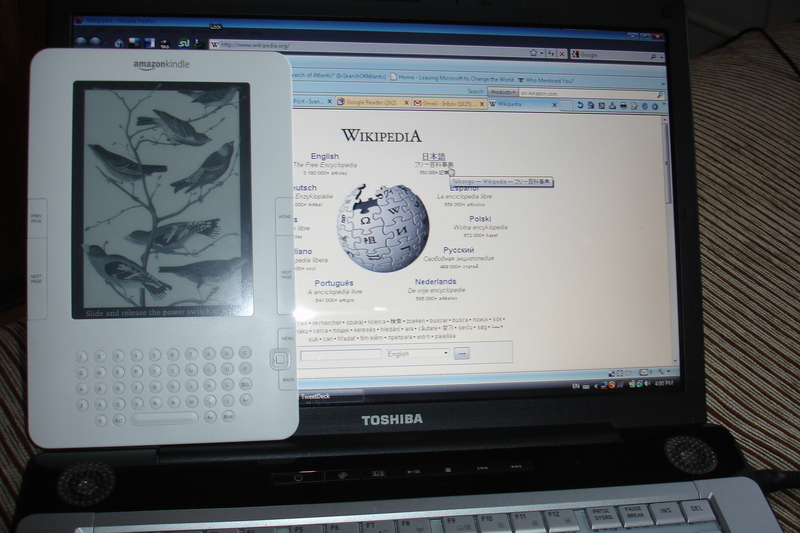 I know that I can use built in wiki in my Kindle now, but I have to navigate to wiki and type in what I am searching for. It seems I am pretty lazy bump, now;-) I am not, I am just pondering how to get maximum from reading experience. Does anyone know if it is possible? Is it coming up? Is it already working for any Kindle books? Does your Kindle have the dictionary built in? On mine, I can highlight a word, and see its dictionary definition immediately. Did you see that Amazon are going to open up the Kindle to allow others to develop applications? And open an application store? and you know about the Windows kindle application? I appreciate your sincere effort to give it a thought.